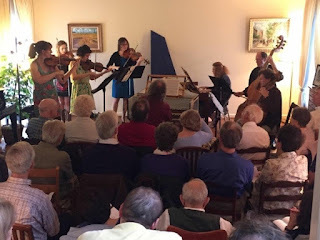 My first encounter with Jonathan Salzedo’s Albany Consort took place on March 24, 2009, when they presented a Noontime Concerts recital celebrating the 324th birthday of Johann Sebastian Bach. Bach was born at a time when different parts of Europe were using different calendars, the older Julian version and the newer (as of 1582) Gregorian. For this reason Bach’s Wikipedia page gives his birthday according to both calendar systems. As a result, those wishing to celebrate the occasion can usually get away with doing so sometime late in March. Honoring that time frame, the Albany Consort will be returning to Noontime Concerts to celebrate Bach’s 333rd birthday. For this occasion Salzedo will be presenting Bach’s BWV 988 set of 30 (“Goldberg”) variations on an aria theme. Bach composed this for keyboard, and several of the variations indicate that two separate manuals are required. However, Dimitry Sitkovetsky prepared an arrangement for string ensemble, which Salzedo’s daughter, violinist Laura Rubinstein-Salzedo, performed during her studies at Juilliard School. Those who have been around here for a while would not have had to travel to New York to learn about this arrangement. The New Century Chamber Orchestra performed it in November of 2010, and the San Francisco Chamber Orchestra took their turn with it early in 2012. However, Salzedo describes himself as “an incurable experimenter.” Thus, while he was willing to take Sitkovetsky’s arrangement as a point of departure, he tinkered with the score enough to put his own personal stamp on it. Indeed, he even scored one of the variations as a “family affair,” in which his wife, Marion Rubinstein playing organ, will join both him (on harpsichord) and Laura. The other members of the ensemble that will play at Noontime Concerts will be violinists Rachel Hurwitz, David Wilson, Aaron Westman, and Maxine Nemerovski, violist Katherine Hagen, cellist Joyce Park, and Roy Whelden on violone. This performance will begin at 12:30 p.m. on Tuesday, March 20. As always, these concerts will take place at Old Saint Mary’s Cathedral in Chinatown. The cathedral is located at 660 California Street, on the northeast corner of Grant Street. There is no charge for admission, but this concert series relies heavily on donations to continue offering its weekly programs.